Welcome to Schnauzer Pictures. It's a great new gallery for your and our favorite Giant, Standard and Miniature Schnauzer photos. If you - like me! 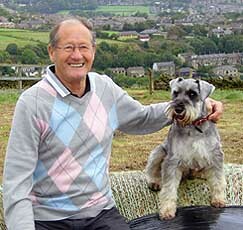 - have a handsome pooch, why not show him off here? Has he (or she) got a really cute face, any unusual habits, toys or games? Well, we'd really like to see them. 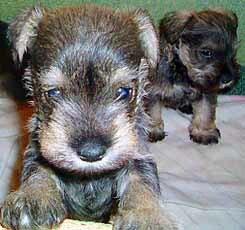 By the way, there's plenty of Schnauzer and Schnoodle pictures on our other pages. Max aged 5 weeks photographed at the breeder's home before we took him home. Max 3 weeks later during his first days at home - getting used to the Yorkshire weather. Crufts 2008 winner Philip the Giant Schnauzer enjoying a swim near his Sussex home. This salt-and-pepper Standard Schnauzer has the longest eyebrows we've ever seen. Good to be alive...! This cute Mini Schnauzer from Canada looks very pleased with himself. Max in the bath after a super day's hike in the Pennine hills of Yorkshire. This white Mini Schnauzer seems very happy with his new sweater for Christmas. Ceasar, rescued from North West Indiana by Valley of the Sun Giant Schnauzer Rescue. Max again - enjoying the outdoor life with my Dad in the field at home. 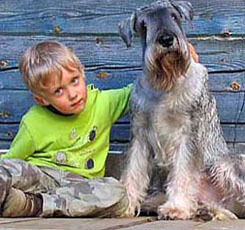 Schnauzers are great companions for young and old alike. This unusual looking Giant Schnauzer from Eastern Europe shows just what gentle giants these dogs are. This 6-week-old purebred Miniature Schnauzer puppy is all set for his very first picnic. What a handsome fellow! This lovely European Standard Schnauzer proudly shows off his long curly tail. Is it a wolf...is it a giant black coyote? No, it's Crufts Champion Philip racing along with the wind in his fur....! Another cutie - this time a beautiful white Miniature Schnauzer puppy. This posh black Standard Schnauzer is a shining example of meticulous grooming. One of our favorite photos of Max. He looks like he's really enjoying life! IMAGES ARE SUBJECT TO COPYRIGHT LAW AND MAY NOT BE COPIED. Got a Great Schnauzer Photo? We love taking photos of Max. 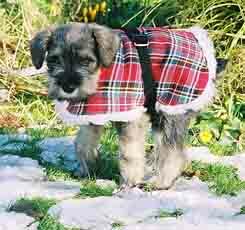 In our opinion Schnauzers are the best-looking dogs in the world, bar none - they are SOOO photogenic! We're always on the lookout to capture that "magic moment" of Max on camera, it's all part of the fun of being a Schnauzer owner. We all have a special photo of our beloved pet - why not share yours with us and our visitors, we'd love to see them! 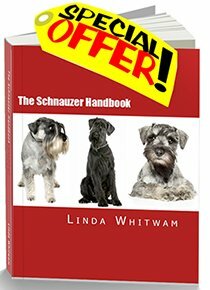 Send us your favorite Schnauzer photo or photos and we'll create a new page on our website which you can share with your friends and fellow Schnauzer lovers. It's really easy to add your photo. Just click the Browse button to find the photo on your computer's hard drive. Then select it. This is Thor, he's 1 year old (March 12th), his mom is salt and pepper colored and his dad is white. What color schnauzer can he be classified as? The best girl anyone could ask for! She is 13 years old and slowing down a bit, I cherish every moment with this little lover. My Christmas photo-shoot.. by Benji.. It's Me.. Benji in funny photos.. !!! My Loo Seat..Frisbee.. !! By Benji ..
Benji after a long Saturday..
Benji's PINK sandpit… AGAIN.. !! My " PINK " Sandpit..
Cash's (named for Johnny Cash) got his first hair cut at 5 months old, NOTE FROM LINDA AND MAX: He's a beauty! Oh, no, is it time for my bath? First SNOW for Rebel and Benji. !! We are taking a Nap.. Still one of the photos from a few weeks ago, Archie playing with things he shouldn't play with! Rebel and Benji... Showing Off..
our schnauzer security team, ready to keep the burglars away. Benji wanted to post other photos.. with Rebel..
Me... BENJI... after my Grooming session..
All this for Christmas ! Ho ! Ho ! Ho ! BENJI " On Guard.. " !! My Dog Max having a rest after playing in the garden :) NOTE FROM LINDA AND MAX: My goodness, there are some handsome Maxes around! Only 3 Companion Dog Shows & all these Rosettes !! Buddy back home after a trip in car NOTE FROM LINDA AND MAX: He has very aristocratic features! Is Buddy a mini or a standard? Our Jenson is such an opportunist fellow NOTE FROM LINDA AND MAX: He's a lovely fellah! My 8 week old puppy.. BENJI..
Rebel is resting & Rambo wants OUT..
All 7 puppies on my breeder's bed.. so tired !! Rebel after I hand-stripped him..
Niko - the best rescue dog ever! The best little rescue dog ever! Pluto at six months old - what do you think? Here is my dog Pluto aged 6 months. Rebel 2 and Phantom !! This is Ozzy my Mini Schnauzer, born June 2011 he got the name Ozzy after my Australian relatives came to stay the day he was born, so a fitting name. Can I have my present now? Max ready for a nap!! After playing all morning and having a full belly, my sweet Max is ready for a quick nap to recharge his batteries and get ready for more play time. Pedro the Mini after a fun-filled jaunt in (soaking wet!) Dublin, Ireland. I was on our porch early one morning and Charlie decided to keep me company. He is the best dog! I can't imagine our life without him. Shiko was born on 05 Oct 2007. Born with Lazy Leg. He is a real sweetie pie. Look out squirrel - Reggie the Schnoodle is coming after you! What a pair, Tutz 2.5 years old and newby Jewel 5 months, both girls... different parents same breeder... We luv our babes. This is Skooter - is he a Schnauzer??? Max the Schnauzer - What a Handsome Fellow! Max the Schnauzer - Have Wheels Will Travel! Murphy stands out from even a crowd of Schnauzers because of his sticking up ear! He is just over a year and he is loved to bits by all who know him. Under the couch hiding from my wife the groomer. Rosy is a 6-year-old Miniature Schnauzer we rescued as a young dog. This is Lacey shortly after we got her. Isn't she a cutie! Hello Im Nicolas,From Mexicali, Mexico, This is me at home. I hope you like me. Your comments are welcome, love from Mexicali. I was eating lunch and wanted to capture the look on my moms schnauzer face so I took a picture , instead this came out. I just love it so much. Baby Spooky our Halloween puppy. he is the light of our lives. Schnauzer - German for "snow dog"
Milo, our 4 month old mini schnauzer, LOVES playing in the snow! This is Canela looking through the car window... The background is Potrero Chico, one of the best places for rock climbing. Canela loves hiking! Here's another one with a pumpkin.....! Ava on patrol for those pesky birds that think they can land in her yard. She is one year old, look at those big ears! Zippy is always happy despite his handicap of missing a leg. This picture shows him with his Zippy smile and shows just how happy he really is! This is one of our white minis. Edie was dreaming.. of what i don't know. she's was making soft hummming sounds. when i looked at her. this is what i saw! The President Doesn't Have This Much Security!!! It's nice to have big body guards! PLEASE HELP....HAVE YOU SEEN SCRUFFY? Here's a picture of our wonderful mini Schnauzer Murphy who is 3 and enjoying having his photo taken. This is Dutchess, my darling one year old white/silverish mini schnauzer. she was a little diva posing in her sweater! We managed to get away for the weekend just after Easter, our two Giants love the caravan, it's a fight for the settee after a long walk! After a full lap, my dog TT is thirsty and needs some water .. Relaxing after a hard day's graft! Christmas Day 2008 waiting for all the family to arrive. Another Max from the North East of England. Now aged 18 months. I've just got a 6 month + 1 week miniature Schnauzer. When should he be neutered?? The blankie did it ! Well ruby wanted to catch some sun and i thought she was cute and took the pic. no genius though. ESPY and EmmaGrace ready for Texas Football. The traditions continue. Hook'Em Horns NOTE FROM LINDA AND MAX: Love the photo! Gucci, the smartest dog I ever had. 2 years old miniature white schnauzer. NOTE FROM LINDA AND MAX: Mary, he's a beauty! Best dog ever! We got her when she was 6 weeks old she's now 2. NOTE FROM LINDA AND MAX: Layla looks lovely and has a very nice beard! Maya is an 11 week old Schnauzer. In the picture she was 9 weeks old. She loves her toys and being out and about. This is Haru Hassam, my buddy! Posing after a day at the park! Angus loves a Jeep ride. My toy sized liver pepper schnauzer produced this little surprise in her litter early this year. A liver and tan toy sized puppy. Sammy is a famous actor! He's always busy looking in the Mirrors and out the windows. Avi is so smart, we sometimes think there is a little human being inside him. This is our new mini schnauzer Prince. He is 7 months old now, very playful and charming to everyone. He loves to pose on camera, as you can see! This is a pic of Zippy, a tripod schnauzer mix, after he helped his mama dig flower beds! Taylor loves to be held!! She is very playful and happy all of the time :).